Consensus science has been refined to a pure brainwashing art form in today’s society. It is has been called groupthink but is far more sinister than simply people thinking the same way, it has become the primary method of forwarding an agenda by the commie micro-minority in America. They have been forming since the 60s by the Anti-war communist loving radicals who have found how to manipulate the country’s consciousness through academics and mass media to provide the narrative that liberalism is good and conscious while Capitalism is evil and compassionless. This has been formed and maintained through a corrupt academia and media to the point of nobody seriously arguing the point. The way this works is academia takes a study they want to promote such as Global Warming or tobacco and do all they can to destroy an industry. They will have fake studies such as secondary smoke and use the most questionable data of the connection between secondary smoke and find respiratory problems in the families of smokers whether there is a connection or not. They will say there is a 1% chance of having lung problems if you live with a smoker even if there are a hundred other reasons because the tobacco industry is a vilified business. They will then promote agenda laws such as making smokers smoke five hundred yards from a building even if there is absolutely no reason for it other than vilifying tobacco. Now we have smokers outside and even when outside are not able to smoke in parks, bus stops or anywhere near people like they are lepers. There is no real medical reason for them to have to be ostracized by liberal lawmakers other than tobacco has been defined by science, media and lawmakers as an evil product they have communally decided to destroy. Even though people around the world enjoy smoking there is a very small group of liberals who have turned it into an evil product through consensus. The other side of the equation is their promoting of dangerous activities such as vegetarianism or homosexuality, there has been a consensus they are healthy lifestyles even though the data says just the opposite. They are both nothing but agenda driven academics promoting a lifestyle to destroy the beef industry and morality through fraudulent science and consensus promotion. There are many scientific studies showing both vegetarianism and homosexuality shortens people’s life spans as well as keeping them susceptible to disease the entire time they are living these dangerous lifestyles. This will not be reported since both these lifestyles have been given sainthood status by the liberal communal establishment. So girls grow up thinking they are being holy as vegans even though they are destroying their bodies all in the name of becoming good people. The cult of liberalism requires people to live by a set of tenets to becoming a good person. The more of these tenets a liberal abides with the better a person he becomes until he or she reaches a type of sainthood or a perfect worshiper and eventually utopia. We have all seen them, eating carrots or celery and talking sanctimoniously how tolerant they are of any outrageous behavior. They will condemn anybody on the right who is not tolerant which is their only deadly sin. This allows them to excuse any immoral personal behavior while living and thinking socially moral lives. For a girl she can have multiple partners, have an abortion and as long as she is a vegan and tolerates homosexuality, she is a good person while killing the baby is excused and in some circles celebrated. Academic consensus and SoddomWood have painted a picture of what is right and wrong in America that has been promoted by the media to make these the dominate beliefs of what is good and bad. The fact that Conservatism has survived at all is one of the great miracles of histoir. These commie libs have become so militantly anti-capitalist they have exposed themselves for who they are and people are pushing back. With their frauds being revealed like Global Warming and academia repeatedly having to reverse itself on national findings such as the Spotted Owl hoax more and more people are beginning to understand this isn’t science but social engineering. These are simply scare tactics to force Americans to live the way these scientists believe is the best way to live. By consensus these scientists and academia have decided communism is better than capitalism even though they can’t find one example where that is the case or has been the case throughout history. Every time it is tried it is always followed by misery, starvation and killing fields but by consensus these academics have decided communism works and would work fine in America. Using academic groupthink while ignoring the facts of the situation or how many success stories capitalism has provided they all decided that a Soviet lifestyle is far more efficient than freedom and self determination. They have manipulated the data and promoted this fraud as another agenda driven junk science that we are all paying the price for. They believe Central Planning works as long as they are in control of that plan. This theory has been expanded by the corrupt media and of course the DNC. Now it is accepted truth with all the excuses and talking points to promote this political dead end which lead us to boondoggle trains, rather than cars, solar rather than coal and Solyndra rather than Keystone Pipeline as well as welfare rather than employment. We have a pipeline which would create massive employment and wealth for no cost to the taxpayer, yet since it would promote capitalism rather than communism it was vetoed by this regime and his comrades in the Senate. 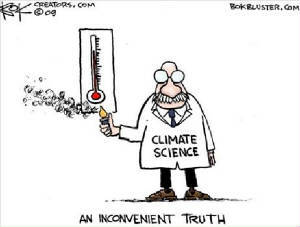 This decision was originated in academia which made false studies connecting it to Global Warming then handed that junk science over to the mainstream press secretaries and finally to the corrupt politicians. Everybody loses except those professors and politicians on the gummit dole and will eventually vilify oil as prices increase. No cheap oil, no construction jobs paid purely by the oil companies and no expansion which this oil would naturally develop. All we got were slogans, clichés and more communal misery, so how about a slogan for our side? Power to We the People!